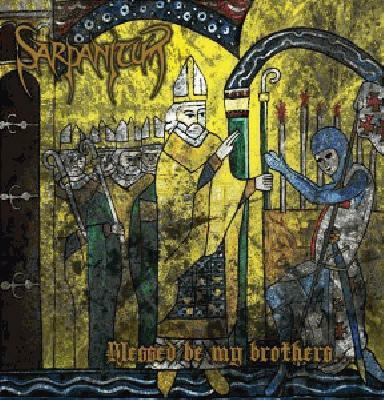 Review Summary: Sarpanitum bring an effort that is both seemingly brutal and triumphant. Death metal has never sounded so triumphant. In a genre primarily composed of gurgling, grunting and blast beats there is often little room for bands to present anything uplifting. Sarpanitum new effort manages to create a dramatic outing that is both heavy and at times inspiriting and triumphant. This is achieved through the dichotomy of their song structures, seamlessly switching between brutal heavy tremolo picked riffs, blast beats and synthesizer friendly melodic sections. Granted synthesizers on a death metal record are not usually my cup of tea, they tend to generally be a recipe for disaster given their lofty soft nature in opposition to death metal’s unrelenting brutality. This time around however the band manages to find a way to truly make it work, synthesizers are used sparingly and effectively confined primarily to interludes and melodic sections. The synths and samples are often subtly worked into the mix and build as the songs become increasingly dramatic and uplifting. Melodic sections of this album can primarily be described in one of two ways: angelic or triumphant. This is an album in concept revolving around concepts of religion, praise and war in context of a medieval setting. In this regard the album is very successful in reflecting its lyrical content in the style of the music. Fear and even praise of the divine is discussed of the masses preparing for war in both uncertainty and triumph to the melodic dramatic riffs that cry out. The song ‘Malekal-Inkitar’ is a prime example to display the beauty of their more melodic sections. Riffs are brimming with personality, emotion and stillness. Before even reading into the lyrical content I already had a strong sense of the album’s narrative which in of itself is an accomplishment showing how the band is able to convey emotion and story simply through the use of instrument alone. The song builds and finally explodes into a climax with the inclusion of synthesizers to bring everything together into a triumphant epic section that wouldn’t sound out of place on a power metal album. In some ways this album feels inspired by power metal more so in theme than actual instrumental style. Although this album is at the end of the day a death metal album it has an unquestionable uplifting grand and positive vibe to it all. The narrative of this album is greatly complimented by the album’s heavier sections which are truly excellent as well. In the band’s heavier sections they take on more black metal influenced riffs with tremolo picking and blast beats being commonplace, drawing a notable influence from the likes of Immolation. Sparingly and effectively the band makes use of slams to really kick the album up into new time signatures and tempos making the album feel evolving and purposeful. The heavier sections come across as darker and more serious giving the album a dichotomy feel to it by which the album transitions between heavenly melodic passages and brutal death metal riffing. The songwriting on this album is downright superb, the heavy brutal sections transition seamlessly into the more angelic melodic sections. The interplay between guitars is a big part of the success of this album, there is great chemistry between the lead and rhythm guitar making riffs dizzying complex at times.The rhythm guitar does a fantastic job of support by adding layers of subtlety that makes ‘Blessed Be My Brothers’ an affair worth coming back to again and again to pick out the subtleties. The rhythm guitar also shows its chemistry with the rest of the band by showing great support for the song structures, often times the rhythm guitar will dip into lows or play thumping triumphant riffs that add a notable layer of catchiness to this album that constantly keeps the album fresh and invigoratingly entertaining. This album is brimming with personality, charm and excellent songwriting however that is not to say it is without its flaws. The drumming in particular on this album can be quite questionable at times, it is mixed extremely low and sounds thin and puny compared to the rest of the band. In addition for most of this album it sounds lifeless without personality I actually had to go look up if the band was using a drum machine for this album because it sounds so fast and artless that it just comes across as hollow. Perhaps if the drums were mixed higher it would be easier to pick out its subtleties or interesting sections however the drums being so badly buried in the mixed it is easy to forget to pay attention to them or even notice them a lot of the time. Part of this mixing problem is also in part due to the guitars being extremely loud, drowning out everything else especially the lead guitar. I do feel the rhythm guitar is better off in the mixing choice however due to its successful support of the lead guitar that really brings out the best of the entire soundscape however I can’t help but feel in this regard the rhythm guitar loses a bit of personal identity as a result. Then there’s the interludes: they just don’t work, it is hard to understand why the band would include them if they had no intention of smoothly using them to transition between new songs and ideas. They feel really tacked on like they were made as a last minute decision after the album was already complete, the songs before and after each interlude often have absolutely nothing to do with the tempo or mood of the interlude and as a result it makes the listen feel uneven and disjointed. Overall this album is excellent, brimming with personality in an all too stagnant genre it is hard to believe a band could make an album that is so seamlessly brutal as well as uplifting. There is great chemistry and vision between the band members but some songwriting and production choices hold the album back from living up to its full potential. The clean and polished style of the production may turn some die hard death metal fans away but their style is unmistakably Sarpanitum. Loving this album right now. out of curiosity what didn't you like about it? Nice review, glad to see someone else digs this. The brutal parts are like Immolation and I don't think the more uplifting sections feel gimmicky at all. I disagree with your opinion on the mixing of the drums though, I think they sound fine. In that case I'll take a dollar for every time someone acts bitter about other people enjoying an album they don't like. I need to give this another listen. I don't think I'm being overly defensive about anything, but incessant negativity runs rampant and it isn't necessary. Love and peace! Surprised by how many people don't like this seeing as it has been receiving quite a fair bit of praise around the internet. This album takes some getting used to, and I would agree that the production could have been much better but if you can look past that hurdle, u will find a very innovative DM album, not perfect by any means but at least it takes some risks. Agreed, they have a lot of potential, just need to sort out the production. I agree with you, blind enjoyment can be bad just like blind hatred. I genuinely like this though, I don't see how it could be considered awful. The production doesn't irk me like it does a few others who've complained about it either. This isn't really close to my favorite dm albums but I think it's quite good apart from a few leads that could have been done differently.